I love leaf tea. When travelling I browse tea houses, sniffing and tasting , and always come back with some exciting finds . This spring I came back from The Tea House , Covent Garden with a strongly smoky Russian Samover tea, and a delicate Nepal tea. As we wandered around the shop there were so many cool tea accessories: strainers ,tongs, tea balls and teapots. Beautiful chinese porcelain pots. They were gorgeous and I was tempted to bring one home. But I knew. I have the perfect tea pot. We’ve all bought bad teapots. The teapot that looks good but just doesn’t function well. The handle is too small or too big, the lid falls out as you are trying to drain the dregs out out of the pot, the metal one that burnt the hand off you, or my most hated fault, the dribbling spout. I found that the quirky teapots were the worst . they just weren’t meant to function. 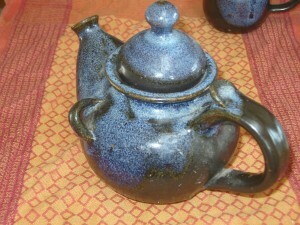 There she was, the most beautiful teapot I’d ever seen ,a little bit like a blue alladins lamp. I picked her up .The handle was perfect with a little lip on it to rest your thumb and there was a tiny handle on the side for added manouvering. Lovely!. But Ive been burned before by beautiful but dribbly pots. So the lady running the gallery took me into the tiny storeroom in the back and we tried out the teapot with water. Nary a dribble. Brilliant! It took 20 years but I found the perfect pot. So I brought my pot home and used her for years. She fits about 2 1/2 mugs of tea which is fine for me and 1 visitor ( or just me ). However I discovered when we had builders in, that thats not enough. ( Some thoughts spring to mind: Why do builders drink so much tea, does it give them super builder powers like not listening , is that all they drink? could we harness the power of builder tea to run the world) . Anyway another trip to Kerry was in order, so I called the potter and we made an expedition down to Ballyferriter to get us a big pot and one for the builder too. So now I have my wee pot for me and the giant builder pot. Children and clumsy people aren’t allowed to touch them. They are far too valuable . 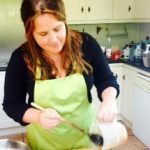 So if like me youve been searching for years for the perfect pot , heres where to get one. 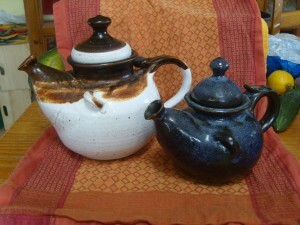 The pottery is Faoilean Pottery Studio, Ballyferriter West ,Dingle 066,9156294 .email: faoileanpottery@gmail.com. Apart from making perfect tea pots and other stoneware ,the pottery also runs classes on pottery painting. Cool!